This fast-paced, industry-recognized program offers a 36-month Horticultural Diploma, providing unequaled job placement in the industry post-graduation. Students will network with horticultural industry professionals in this unique educational experience on a living campus: the world-renowned Niagara Parks Botanical Gardens. The Niagara Parks School of Horticulture provides the opportunity for students to engage in experiential learning where students develop horticulture knowledge, skills in a project-based, team setting. The program offers a unique alternative to post-secondary education and provides graduates with a credential that is highly regarded within the horticultural industry. The synergies created by experiential learning develops the student’s technical skills, knowledge and confidence while building leadership abilities necessary to succeed in today’s job market. Students join crews of industry experts where they are fully engaged in an experiential learning approach over the 36 month program. Take advantage of industry-relevant internships; curriculum in experiential learning, leadership and social entrepreneurship; and residence included in year one and two. Tuition rates of $1,500/year include residence and meal plan. The completion of the program requires thirty-six consecutive months, beginning the last week of March. Students are responsible for a minimum of a forty-hour work week, Monday to Friday, made up of practical work and academic lectures. The school academic program runs year-round, with the primary academic term running from September to March. Academic courses build on the knowledge gained through the practical horticulture experiences of maintaining the plant collections, gardens and landscape features of the Botanical Gardens. Course Code: APH 613 Students participate in greenhouse procedures used to produce and maintain greenhouse exhibition crops and bedding plants. Cultural requirements and methods involved in growing selected exhibition plant material for a greenhouse conservatory use will be studied. Course Code: HRT110 This course examines the taxonomy, morphology and physiology of insects. Students complete laboratory exercises and projects designed to examine insect structure and function in relation to identification and control. Course Code: APH611 Students gain knowledge and skills in the safe operation of selected horticultural equipment and learn the operational purpose of equipment to complete horticultural work. Through practice sessions with the equipment, students learn to complete circles checks and use controls to operate equipment safely. Course Code: HRT111 Students gain an understanding of the fundamental principles of growing vegetable and fruit crops for the fresh market trade. Through the combination of hands-on and theoretical exercises, student gain an understanding of the identification, selection, establishment, culture and maintenance of selected fruit and vegetable crops. A strong emphasis is placed on production scheduling, harvesting expectations and product quality. Students independently design and maintain their own vegetable garden. Course Code: PID310 The knowledge and identification of plants is an essential skill required for persons pursuing a career in horticulture. In this course, students participate in plant tours and independent study to learn the identification, culture and maintenance of selected spring and early summer blooming herbaceous perennials, weeds and aquatic plants. Using acquired observational skills, students learn to identify plants using botanical nomenclature and apply knowledge of plant culture. Course Code APH612 Students participate in hands-on activities to develop skills and competencies in selected horticultural techniques. Through interactive demonstrations, students learn the techniques and practices expected of a professional horticulturist in industry. Skill development is reinforced through participation in activities related to specific horticultural tasks. Course Code: PSC212 The focus of this course is to introduce students to the role of plant pathogens in causing disease. Students learn to recognize symptoms of pathological diseases and relate them to the life cycles of selected plant pathogens. Control methods are studied with an emphasis on the factors influencing disease management. Course Code: LDS513 Students refine their landscape drafting skills. Through the application of the design process and the fundamental characteristics of design quality to progressive residential landscape design problems, students improve their design skills. Graphic illustration is practiced and applied to augment oral presentation techniques. Course Code: LDS512 This introductory course focuses on the basic landscape design process and drafting skills. Students investigate historical and geographical influences on current landscape design theory. Drafting skills are developed that are necessary to prepare landscape plans and details. Students create a base plan for landscape designs of specific residential sites. Course Code: LDS510 Students learn to thoroughly collect critical site data for planning landscape projects and use survey equipment for field measurement and site layout purposes. A strong emphasis is placed on proficiency with calculations used in planning and estimating projects. 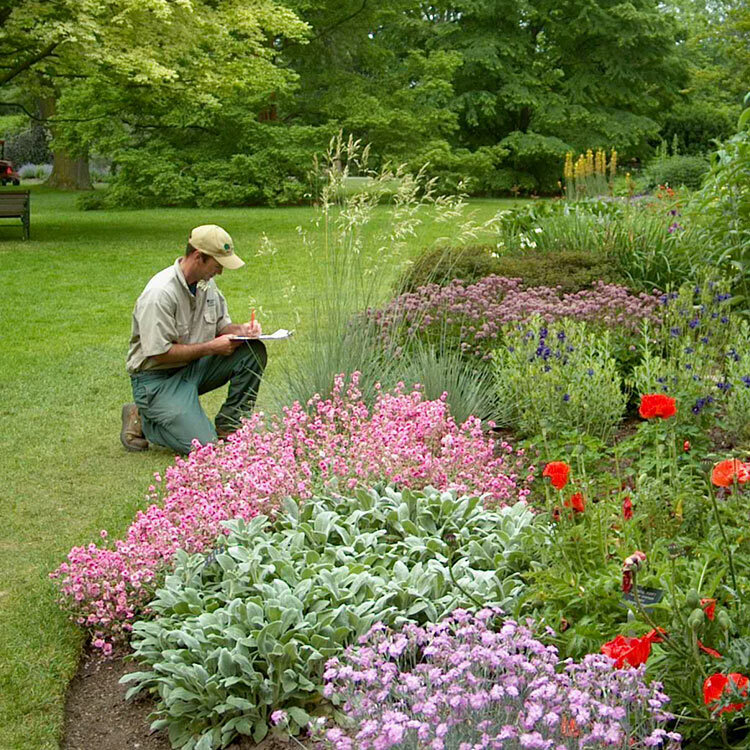 Students calculate quantities of materials required to complete selected horticultural or landscape projects and are required to record field notes, complete projects, and complete drawings associated with field work. Course Code: PID311 The knowledge and identification of plants is a fundamental skill required for persons pursuing a career in horticulture. In this course, students will participate in plant tours and independent study to learn the identification, culture and maintenance of selected fall blooming perennials, annuals, grasses, ground covers and broad leaf evergreens. Students use taxonomical nomenclature to identify plants and apply knowledge of plant culture. Course Code: LDS511 Students create garden designs using seasonal bedding, bulbs, roses or perennials. Students gain an understanding of the cultural and maintenance requirements necessary to create landscape designs when using seasonal bedding plants, hardy bulbs, roses and perennials. Course Code: HRT112 Students learn the complex relationships of soil properties and the processes of soil development. The principles of weathering, profile development, classification and biology of soils are studied and a strong emphasis is placed on the interrelationships between soils, plants and organisms. Through the combination of hands-on, laboratory and study tour exercises, students will gain an understanding of the management of soils. Course Course: HRT113 Students are introduced to the theories of tree climbing and related arboriculture practices. 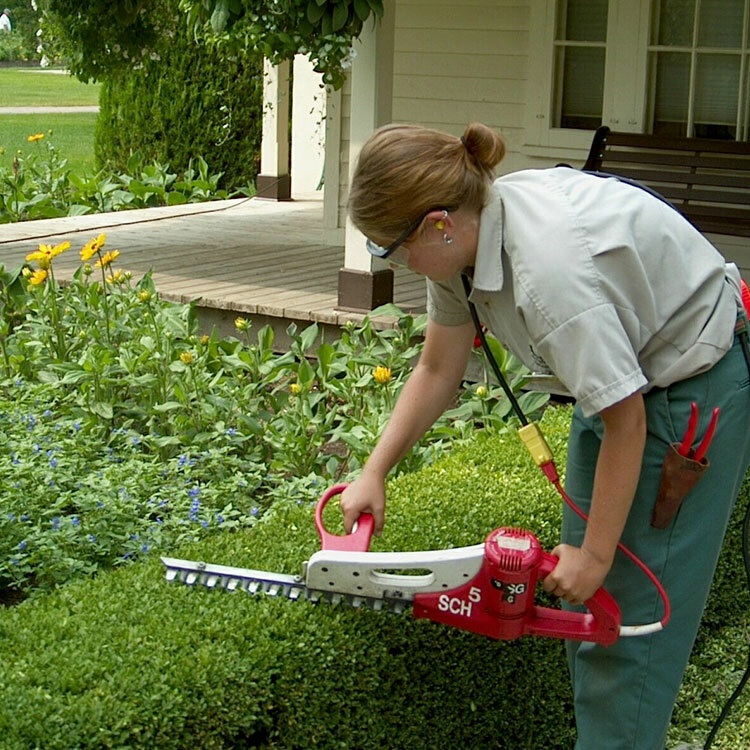 Pruning cuts are studied with an emphasis on process and a tree’s reaction to cuts and wounds. Climbing theory and specialized tree management practices are studied to prepare students to safely work within and around trees to complete arboriculture work with specialized equipment. Students learn to write reports assessing tree hazards and learn how to determine the value of trees in landscapes. Course Code: APH614 Students participate in tours and scheduled classes to learn the fundamentals of workplace health and safety. Through a series of demonstrations, class discussion, and case studies, students learn the steps involved in dealing with workplace safety precautions and after incident procedures. Legislation governing health and safety is studied with an emphasis on creating a safe work environment. Course Code: HRT122 Students learn the complex relationships of chemical properties of soil. The principles of Cation exchange, soil pH, buffering capacity, soil colloids, and fertilizer formulations are studied with a strong emphasis placed on the importance of macro and micro nutrients. Through the combination of hands-on, laboratory and study tour exercises, student will gain an understanding of the management of soil nutrition as it relates to plant health. Course Code: LDS520 Students apply principles of design to develop solutions to selected landscape situations. Students learn to integrate selected landscape structures and surfaces into landscape plans. Business and financial management principles of landscape design are studied by calculating material and resource requirements, developing project estimates and budgets and making professional presentations to clients. Course Code: APH623 Students develop their greenhouse technical knowledge by completing tasks related to greenhouse production. Cultural requirements and methods involved in growing selected plant material are studied. Students participate in activities representative of commercial greenhouse production facilities. Course Code: BUS423 This course introduces students to macro business principles affecting the Canadian economy. Students assess regional and global factors influencing business in Canada and assess the implications of decisions related to business ethics. Consumerism and marketing are reviewed in relationship to business success and their impact on selected trade markets. Course Code: BUS422 Students are introduced to management concepts with an emphasis on developing the skills necessary to be effective supervisors. Case studies are analyzed to acquire knowledge in leadership and management of human resources. The impact of labour relations and management of factors affecting staff management are studied by assessing realistic work situations. Course Code: LDS521 Students gain an understanding of the techniques involved in building landscape construction projects. Together, students manage and complete on-site construction projects representative of jobs in the field of landscape construction and installation. Safe working practices are demonstrated in hands-on field work. Course Code: BUS420 Students learn strategies and techniques to develop their presentation skills through the practical application of principles related to oral communications. Students prepare, deliver, and evaluate selected styles of presentations. Technology is used to enhance communication in situations representative of the horticulture industry. Course Code: PID320 Students participate in plant tours and independent study to learn the identification, culture and maintenance of selected deciduous shrubs and vines. Students use taxonomical nomenclature to identify plants and apply knowledge of plant culture. Course Code: PID321 Students participate in plant tours to learn the identification, culture and maintenance of selected conifers. Classes focus on the use taxonomical characteristics and nomenclature to identify plants and apply knowledge of plant culture. Through independent study, students learn about conifer reproduction, where and how conifers grow in their natural habitat, and how conifers interact with nature and other natural elements. Course Code: PSC220 Students learn the abiotic causes of plant diseases, how plants interact with pathogens, the affect of human activity on disease epidemics, and disease management strategies. The disease cycle and prevention and management techniques of selected plant diseases affecting the horticulture industry are studied. Through an independent study project, students explore current research topics in plant pathology. Course Code: PSC221 This course focuses on the principles involved in the propagation of plants both sexually and asexually. Students complete lab exercises to develop skills in selected propagation techniques and apply principles of propagation to specific horticultural situations. Course Code: BUS421 Students develop skills and strategies they will need for professional communication in the workplace. Students learn principles of effective business communication and strategies for handling professional situations through the completion of business writing exercises. Students prepare resumes to prepare for employment. Course Code: PSC222 Students will gain an understanding of common tropical plants and how they are used in interior landscapes. The students will be able to select the site-appropriate plants based on cultural requirements, diagnose pests and diseases commonly found on tropical plants, and gain proficiency in tropical plant problem diagnosis. The students will also be able to design, install and maintain an interior landscape. Course Code: HRT121 Students learn arboriculture theory and care of young trees, shrubs and evergreens including practices and principles used in nursery production. Students learn the steps required to make effective tree selection choices based on a site analysis. Procedures for selecting quality plants; planting; staking and continued care for young plants are studied. Through on site demonstrations, students perform pruning techniques used on young and mature trees. The urban landscape is analyzed and the challenges with growing trees in an urban environment are assessed. Course Code: HRT130 Students study commercial greenhouse structures and components for the production of horticultural crops. Managing greenhouse conditions to control plant growth are studied through the use of case studies and visiting commercial greenhouse operations. Control of greenhouse pests is studied using an Integrated Pest Management approach. Course Code: LDS530 Students develop skills in the application of computer-aided drafting software necessary to prepare residential landscape design drawings to industry standards. Through practice in the school computer lab, selected residential landscape plans and construction details are prepared including the application of appropriate symbols, patterns, text and personalized features. Course Code: APH631 Students participate in a 10-week internship during their third year of study. Students write a learning plan for the internship and complete the internship based upon their learning goals. Students are required to journal their work activities during their internship and write a report at the conclusion of the internship related to their experiences and their learning plan. Course Code: HORT131 This is an introductory course in the design, installation and maintenance of small to midsize landscape irrigation systems. Students learn irrigation for trees, landscape beds, lawns, and associated site conditions. A strong emphasis is placed on materials, design, and implementation for water conservation including alternative water sources. Trouble shooting and seasonal maintenance requirements are also studied. Course Code: LDS531 Students apply design principles to develop cohesive, practical and artistic master landscape plans for selected sites. Classes will include studio time and site visits to selected locations. Students are required to develop budgets and time schedules for selected landscape situations that meet client needs. Oral and graphic communication skills are enhanced through independent presentations to clients. Course Code: PSC230 Students apply knowledge and competencies gained in previous courses to develop and design models for plant health care. Students develop proposals for integrated pest management plans for selected real world sites. Class discussion focuses on classification, safety, calculation and application of pesticides in horticultural situations. The role of pesticides in society and the associated impact on the environment are assessed. Course Code: PID330 Students participate in plant tours and independent study to learn the identification, culture and maintenance of selected deciduous trees. Students use taxonomical nomenclature to identify plants and apply knowledge of plant culture. Course Code: PID331 Students participate in class to learn the winter identification features of selected deciduous trees and shrubs. Classes focus on the use taxonomical characteristics, nomenclature and keys to identify plants and apply knowledge to key out plants. Through independent study, students learn and practice using keys and characteristics to identify plants. Course Code: PSC231 Students will gain an understanding of the fundamental principles of turfgrass management. Through a combination of hands-on and theoretical exercises, students gain an understanding of the identification, selection, establishment, and maintenance of turfgrasses in residential and commercial settings. Course Code: BUS430 Students learn the practices applied in successfully creating and managing a small business. By preparing and presenting a complete business plan, students learn the principles of business idea generation and evaluation, creation of competitive advantage, marketing, financing, financial and risk management, quality management and taxation. *Note: The courses listed above are the minimum requirements. Course credits earned at post-secondary institutes may be considered as substitutes for the above listed academic pre-requisites. Applicants whose secondary school studies have been completed outside the Province of Ontario are required to submit evidence of equivalent standing. What qualifications do students require before starting the program? Students must have earned a Secondary School Diploma and achieved the required standards in pre-requisite courses, have previous horticultural working experience, and hold a valid Class G2 driver’s license. Are students required to live in residence? Students are not required to live in residence. Niagara Parks provides room and board free of charge as a taxable benefit for first and second year students at the student residence on the grounds of the Botanical Gardens. If a student chooses to live off site, there is no offsetting benefit provided. Are students required to stay in the residence on weekends? Students are not required to stay in residence on weekends, other than on a rotational basis assisting with weekend responsibilities. Are there individual/private rooms available in residence? The residence building has both private and shared rooms. First-year students are assigned to a shared room, and due to a limited number of private rooms, some second-year students are asked to stay in a shared room. Most shared rooms are double occupancy and two rooms are triple occupancy. Private and shared rooms are not air conditioned. The student lounge area and dining room are air conditioned. Is internet available in residence? There is Wi-Fi connection available to students in residence and in the main administration building. Is there a cafeteria in the residence? From Monday to Friday, students in residence are provided with three meals a day. A hot meal is served to students at lunch by the residence chefs. The kitchen is available on weekends for the students to prepare their own meals. What is the role of the “Duty Student”? Students are required to complete a rotational schedule of duty responsibilities. First-year students are required to participate in after-hours residence related duties; second-year students participate in after-hours grounds care and greenhouse care on a rotational basis; and third-year students are required to complete greenhouse care on a rotational weekend schedule. Students are required to wear uniforms issued by Niagara Parks. The uniform policy varies throughout the year and students are not required to wear uniforms to academic classes. Are students required to have a vehicle while enrolled in the school? Students are not required to have their own vehicle. However, currently the school is not serviced by municipal transit although WEGO service is available. If students choose to bring their own vehicle, free parking is provided. Students are permitted to bring bicycles and have access to an excellent trail system between Niagara-on-the-Lake and Niagara Falls. Can students choose which courses they take? All students are required to complete the standard core curriculum each year which includes all academic and practical courses. When are the student holidays? What equipment do students learn to operate? Students learn the safe operation and use of selected equipment related to horticulture. A variety of manual and power hand tools are used as well as tractors and trailers. Full orientation to each piece of equipment is covered in an introductory course related to equipment safety and operation. An internal licensing system is used to qualify students on competency of tractor operation with a loader attachment and a trailer. When can students apply for OSAP funding? Once a student is officially offered acceptance into the School of Horticulture program, the student must contact the School of Horticulture secretary at schoolofhorticulture@niagaraparks.com to obtain specific identification codes required by OSAP.